The Ombudsman recently met with the CEO and the Mayor in relation to her investigation into ‘secrecy’ and lack of transparency in council decision making. It is therefore astounding that the following has occurred so shortly afterwards. 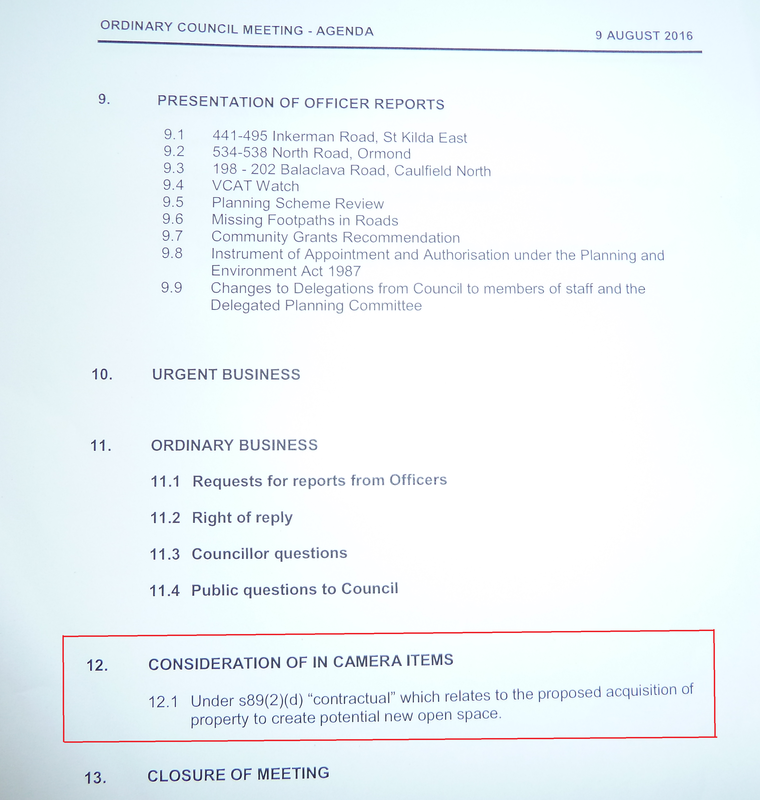 On the evening of the council meeting (ie last Tuesday week) there was this ‘insert’ into the agenda – please note the in camera item. in relation to resolutions recorded in the minutes, incorporate relevant reports or a summary of the relevant reports considered in the decision making process. Residents have no idea as to the ‘report’ much less any idea as to what this resolution concerns, or what its ramifications are? Will council be spending money for open space? If so, how much? Did the report recommend no purchase? Where is this potential open space? Is the location good value? We can only assume that if the wording of the item was changed then it is a deliberate attempt to conceal from the public what is really going on! What makes this even easier to conceal is that council sees fit to provide only half a dozen or so agendas in the chamber when the gallery over the past few meetings has at times contained 10 times this number of residents. Please remember that council has ‘promised’ several times over the years to consider displaying motions, amendments via some form of overhead, so that residents can follow what is going on. Nothing has eventuated! We are confident that the ombudsman would be very interested in this latest example of Glen Eira’s approach to transparency and sound governance and non-adherence to the strictures of the Local Government Act! For all the talk on keeping residents in the loop and consultation Delahunty is a major disapppointment. No gallery for in camera decisions. Secrecy in government can create conditions in which improper conduct and poor administration can flourish. It also fuels suspicions of wrongdoing and erodes community trust. Yep, Guns in Parks is a really good example of confidentiality = sound governance. Nothing changes in Glen Eira. The law is there to be undermined whenever it suits. I had hoped that with a new ceo there would be plenty of improvements in terms of governance and listening to the community. That does not look like it is happening. This was a unanimous vote. I would like to know the reasons why and did anyone speak up about the changed wording of the agenda. Being unanimous means that none of these 9 people deserve to be there come October when they can collude in such behaviour. impossible to argue that this isn’t designed to bury some council decision. That being the case it is the opposite of transparent government. Betyas the dunces now havta pay top dollar when they coulda paid half if they had used sum brains 15 years ago and planned proper.